There are more than 7 billion people living on this planet, each with talents as unique as their DNA. Some people are born with the gift of humour and comedic genius to make others laugh. Some are born with incredible palates and ways of mixing ingredients and flavours together that not only satiate the mouth, belly and mind, but bring friends, families, even communities together in feasts of life and celebration. Some have the innate knack of caring: a desire to save people’s lives – from psychologists to surgeons, social workers to scientists; or firefighters, brave enough to risk their own lives in the hopes of saving others. And then, there are those that give back through their hands, their time and their ability to turn an ordinary day into something beautiful. Those that beat their circumstances and build brighter futures for themselves, by giving back to others. Just like the therapists of Sorbet Group. In the spirit of Madiba’s legacy, the month of July has become a commemoration of all things #good at Sorbet – and Sorbet therapists nationwide are pulling out the stops to keep doing what they do best: giving that feeling. “It could be a simple gesture as a friendly smile, or a compliment; or just making the space for some extra TLC during a Sorbet manicure or facial, that makes the difference. It’s in the little things that we say and do at Sorbet that often have the greatest impact. This is where the magic really happens,” says Jade Kirkel, Marketing Manager of Sorbet Group. 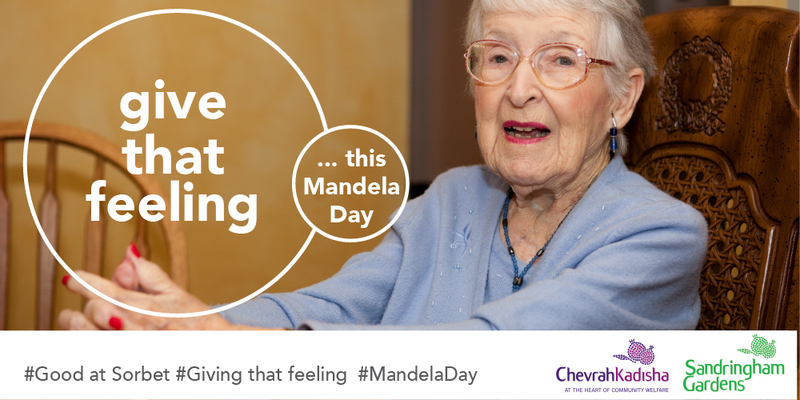 Mandela Day is more than a celebration of Madiba’s life and legacy. It is a global movement to honour his life’s work and an act to change the world for the better. It is also a strong reminder to each and every one of us to use the gifts we have been given – in all their various guises – to make the world a better, brighter, happier, more peaceful, equal and joyful place for all. While July 18th marks Nelson Mandela International Day, which was launched in 2009 in recognition of Madiba’s birthday via unanimous decision of the UN General Assembly, Sorbet will be handing out love to the wise & wonderful in honour of Madiba Day 2016. On July 18th 2016 Sorbet is headed for Sandringham Gardens Johannesburg for a morning of mini mani’s & massages with our elderly community. A humble tribute to the Ones that have seen a thousand smiles, survived a thousand trials & have touched our hearts in between it all.